Description: [spek pro-shoe-tow] The first historical mention of Speck Prosciutto (dell’Alto Adige) was in the early 1300s when some of the current production techniques were already in use. The term “speck” became part of popular parlance only in the eighteenth century and replaced the older term “bachen”, relative of bacon. Speck Prosciutto is a pork product made from a boned ham that is moderately salted and seasoned, cold-smoked and then well aged according to local practices and traditions. The exterior of a slab of Speck is brown, while the inside is red with whitish-pink areas. 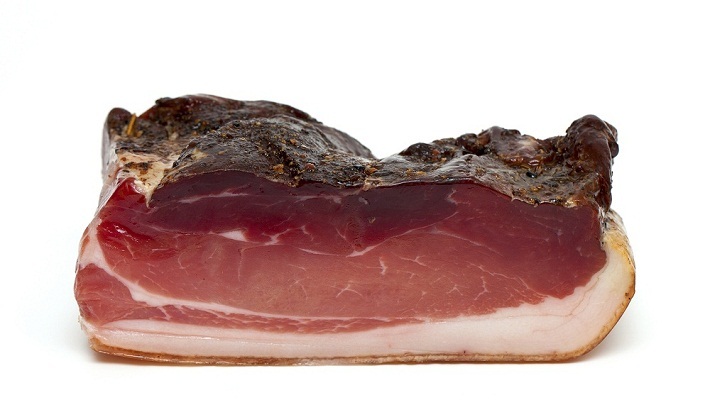 Speck prosciutto has a strong smoky and zesty scent. During the salting process, the meat is flavored with black pepper, pimento, garlic and juniper berry which lend it a distinctive and savory taste. The area of production includes the entire province of Bolzano.